Sales heaven is having a constant stream of high quality qualified leads landing in a CRM or email inbox on a regular basis. Even better is having not only lead data passed over, but a complete view of the buyers journey – what content they have downloaded, what web pages they have visited, what case study material they have received etc, and the qualification route they have taken before being passed over to sales. We call this ‘buyers insight’, sales should call this gold. For any sales team with challenging targets, life would be so sweet if that was happening. For many organisations using a structured and automated inbound marketing process this is reality. The experience of companies who rely heavily on a mixture of telemarketing, events, and advertising etc. to generate leads is somewhat different. Strangely, this is still prevalent in a lot of technology companies and partner channels where you would expect the adoption and best practice use of inbound marketing and marketing automation systems. Don’t get me wrong, inbound is not the only game in town. All of these are still valid demand generation engagement channels, but it’s just that they are not as effective at generating leads and driving them through the funnel ready to engage with sales, and ultimately they are costlier. So let’s explore a few areas where Inbound can get you the sales leads you need. But first of all every company with a sales force needs to be clear that today’s world is ‘buyer or customer centric’. Whatever way buyers have initially engaged with your company or solution: on-line or off line, they are going to visit your website for more information and validation - fact. First of all you need to attract the right strangers to your site. SEO and keywords play a part, but the main online attraction tool is blogging and content marketing, which are promoted via social media channels and emails. Getting this right will drive the initial quantity of leads into the top of the funnel. B2B marketers that use blogs receive 67% more leads than those that do not. So the second task is to turn the visitors into online leads via a call to action (CTA), normally a piece of relevant, interesting content gated by a form. Fantastic, we have their details, but we don’t know if they are genuine leads or tyre kickers, so we need to be a bit smarter and use some techniques to qualify the leads to get the right quality through to sales. Systems like HubSpot allow you to progressively profile leads asking them for different information as they consume more content. This drives quality. Once you have some online leads, you need to develop and qualify these until they are ready to be passed to sales. The best practice inbound technique is to map out the buyers journey from the awareness, consideration and decision stages, and then develop and deliver automatically content that shows how you can solve a buyer's problem with your services or product, and why your company is best placed to deliver value. There are a lot of things to put in place for sure, which is why Intellegentia has developed and successfully deployed an inbound success methodology for our clients. 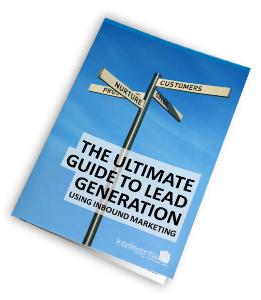 For more information on how inbound marketing can generate high quality leads for your business, download our latest eBook: The Ultimate Guide to Lead Generation. Latest innovations, updates and articles helping you discover the true potential of Inbound Marketing and Inbound Sales. Other ways of learning - join our small group training courses around the UK.